Realize a total return exceeding the Russell 2000 Growth Index over a full market cycle. The Oberweis Small-Cap Growth strategy seeks to capitalize on the exceptional growth potential of smaller companies that are often misunderstood by traditional Wall Street research analysts. The Oberweis Small-Cap Growth strategy generally invests in companies (with market capitalizations under $5.0 billion at the time of purchase) where our expectations for earnings growth differ from consensus expectations. These companies often boast exciting products and/or services, a strong and sustainable competitive position, and the potential for upward revisions in earnings expectations in the future. Our fundamental research process is specifically designed to efficiently identify such opportunities. Our process rests on our firmwide commitment to uncovering and capitalizing on the persistent and recurring stock pricing inefficiencies in small-, mid-cap, and emerging-growth equities caused by a lag in investor response to new information. This lag in recognizing the catalysts likely to positively impact future earnings growth drives the security selection across all our strategies and mutual funds. The criteria used within each product, however, can differ. 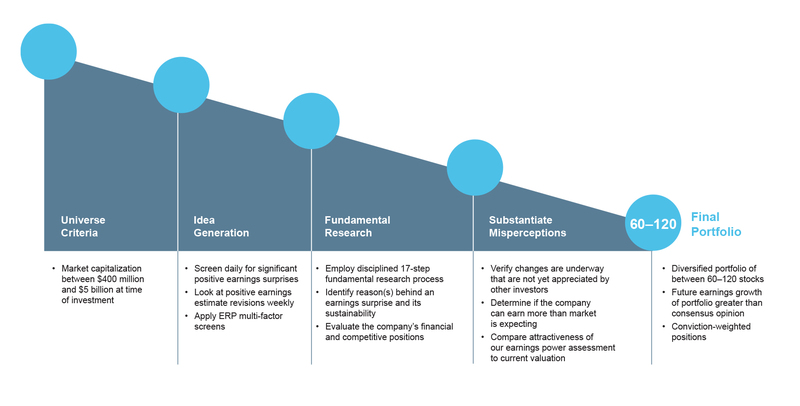 This is how our investment team implements our philosophy in the Small-Cap Growth strategy. *OAM Small-Cap Growth composite inception date: 9/15/96. From inception to April 30, 2009, the composite’s name was Smid-Cap Growth Equity. On May 1, 2009, the composite’s primary benchmark was changed from the Russell 2500TM Growth to the Russell 2000 Growth Index. This change was made in conjunction with a name change of the composite and the removal of the lower bound of the target market capitalization of its investments. The Russell 2000 Index measures the performance of approximately 2,000 companies with small market capitalizations. The Russell 2000 Growth Index measures the performance of those Russell 2000 companies with higher price-to-book ratios and higher forecasted earnings growth rates. Each index is an unmanaged group of stocks, whose performance does not reflect the deduction of fees, expenses, or taxes. You cannot invest directly in these indexes. Oberweis Asset Management, Inc. (OAM) claims compliance with the Global Investment Performance Standards (GIPS® standards). To receive a complete list and description of Oberweis’ composites and/or a presentation that adheres to the GIPS® standards, contact Laura Dombro at 800-323-6166; write Oberweis Asset Management, Inc., 3333 Warrenville Road, Suite 500, Lisle, IL 60532; or e-mail laura.dombro@oberweis.net. Top 10 Holdings as a % of Total Net Assets	Portfolio Holdings are subject to change at any time. References to specific securities should not be construed as a recommendation to buy or sell and should not be assumed profitable.